Sharing this cake just before Fall ends! Last month a coworker of mine visited an apple orchard in upstate New York, and brought back the most delicious apple cider donuts!!! My natural reaction was to make a cake inspired by those cinnamon-sugar covered bundles of joy. 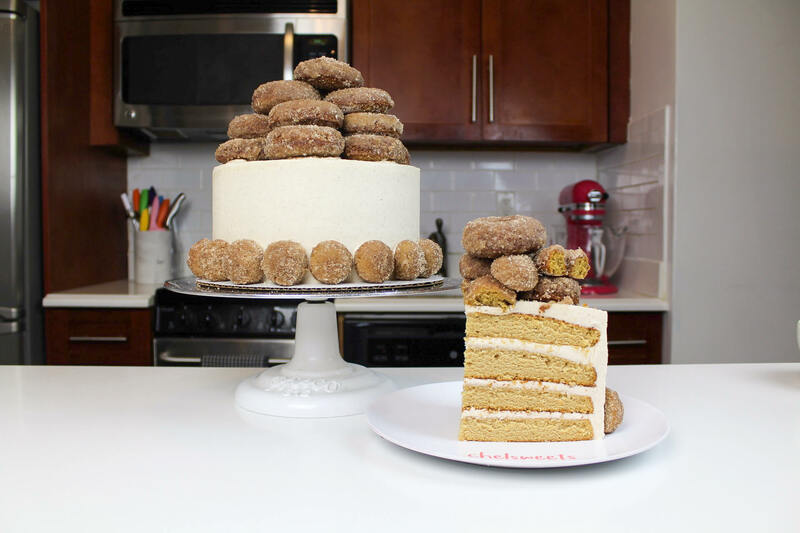 This cake is made with apple spice cake layers, a cinnamon buttercream, and is topped with baked apple cider donuts! 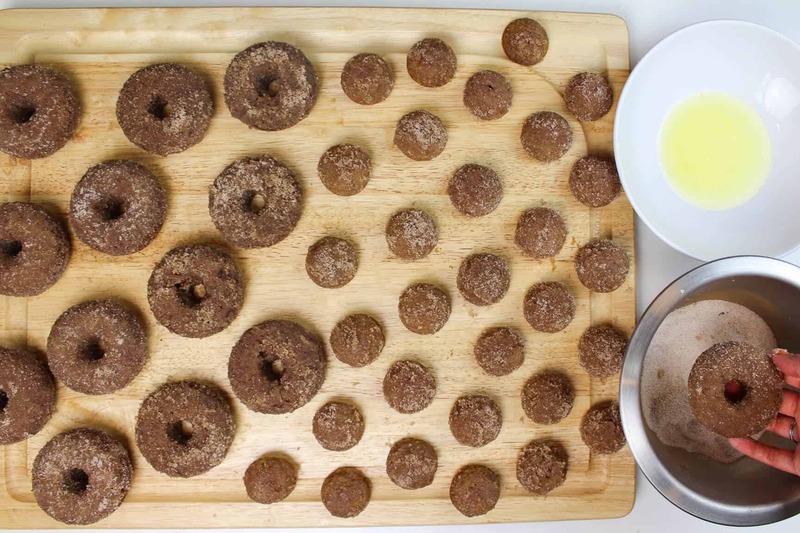 To create the baked donuts, I used Sally’s Baked Apple Cider Donut Recipe! Her recipes are always so delicious, and this recipe didn’t disappoint!! However, if you have access to great apple cider donuts, you could always buy them too to simplify the process. I started by making the baked apple cider donuts. Following Sally’s tip, I reduced 1 1/2 cups of apple cider down into 1/2 cup of liquid, to really concentrate the flavor. I then prepared the batter as instructed, and poured it into a large piping bag. I heavily greased my donut pans and my silicon sphere molds, and baked the donuts for 12-14 minutes (my pans are on the larger side, so my donuts required a few extra minutes in the oven). Once baked, I dipped the donuts into melted butter, and tossed them in cinnamon sugar. I placed them in an airtight container, and then began baking my apple spice cake layers! Begin by preheating oven to 350°F. Line four 7 inch pans (for taller layers) or 8 inch round pans with parchment rounds, and grease with non-stick cooking spray. 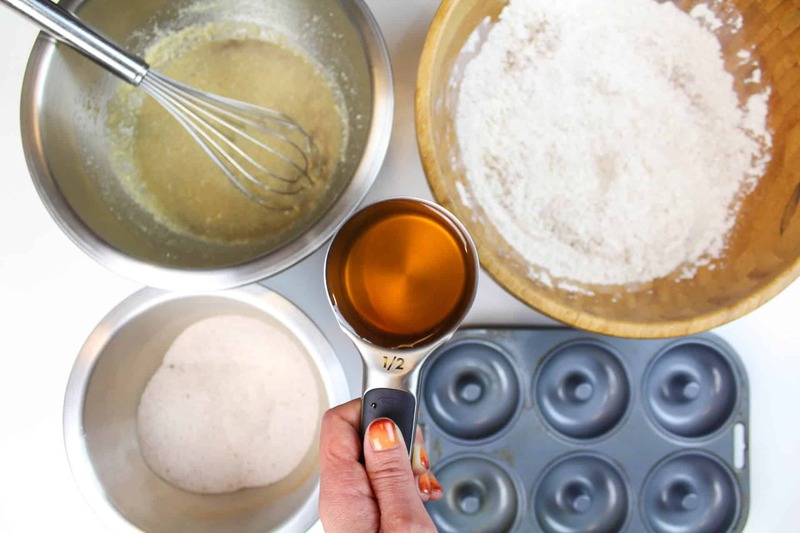 Mix together all dry ingredients in a stand mixer with a paddle until fully combined. Mix chunks of room-temperature butter slowly into the dry mix, on a low speed. Continue to mix until no large chunks of butter remain, and the mixture becomes crumbly. While the layers cool, make the cinnamon buttercream! Beat the butter with the cinnamon, cardamom, and ginger on a medium speed for 30 seconds with a paddle attachment, until smooth. Slowly add in the powdered sugar, 1 cup at a time. Alternate with small splashes of cream. Once the cake layers are fully cooled, it’s time to assemble the cake! 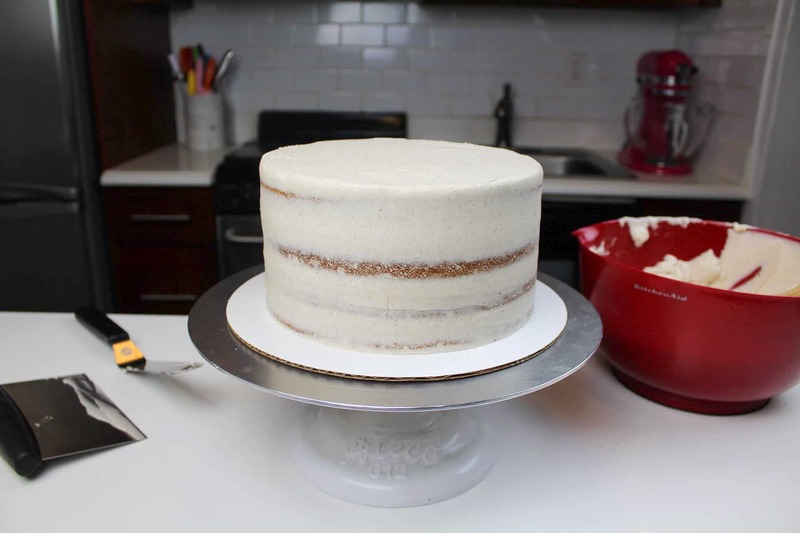 Using a 10 inch grease-proof cake board, begin to stack the cake layers by spreading a generous and even layer of cinnamon buttercream onto each layer with a large offset spatula. Cover the cake in a thin layer of the cinnamon frosting (crumb coat) to trap any run-away crumbs. Chill the cake in the freezer or fridge for about 5 minutes, until the buttercream is firm to the touch. Next, add a thicker, second layer of vanilla buttercream. Use a bench scraper to smooth the sides of the cake. You can see a full tutorial on how to frost a cake with smooth sides here. Use a small offset spatula to smooth the top of the cake. Pipe a bit of buttercream onto the back of each apple cider donut hold, then gently press it against the base of the cake. Repeat this process, entire base is covered. 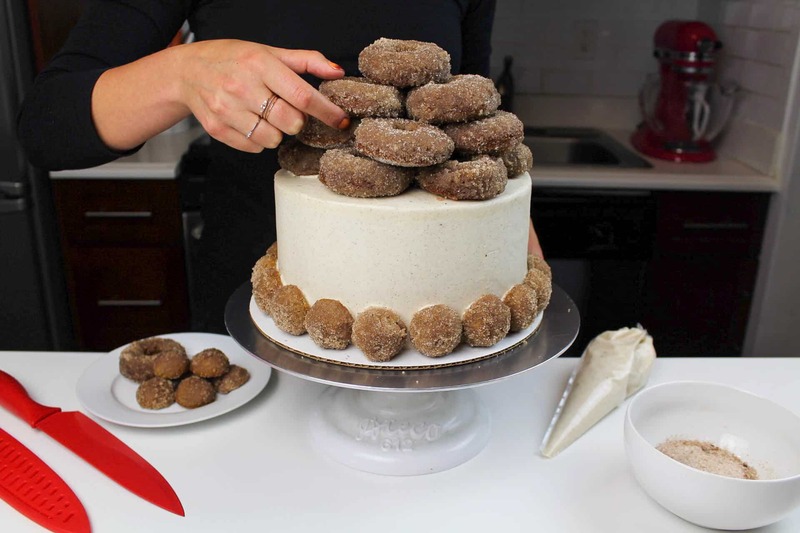 Next, stack the apple cider donuts on top of the cake, creating a donut pyramid! 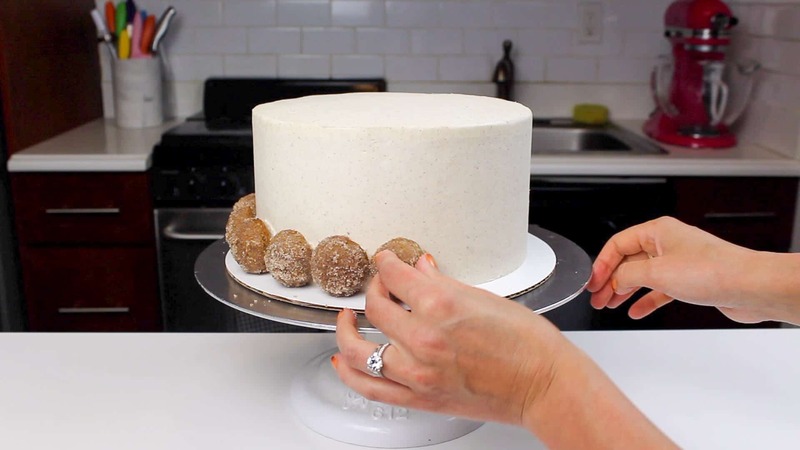 Pipe buttercream onto the bottom of each donut, to help keep them in place once the cake is cut into. Mix together all dry ingredients (flour, baking powder, sugar, cinnamon, cardamom, ginger, and salt) in a stand mixer with a paddle until fully combined. Beat together the butter, cinnamon, ground cardamom and ginger on a medium speed for 30 seconds with a paddle attachment, until smooth. Slowly add in the powdered sugar, 1 cup at a time. Alternate with small splashes of cream. Previous PostThe BEST Black Friday Baking Deals!! The recipe calls for apple cider concentrate but it’s not included in the instructions. Also, the instructions say to add vanilla but vanilla is not included in the list of ingredients. Maybe the instructions say vanilla but should actually say apple cider concentrate? This cake looks amazing…thanks for sharing! Two questions…in the recipe, you don’t mention when to add the apple cider concentrate. I assume it should be added with the buttermilk? Also, I am a little confused by this ingredient: 1 1/2 cup apple cider concentrate (heated on medium heat until it reduces to 1/2 cup of liquid). Do you mean 1 1/2 cups apple cider, heated until reduced to 1/2 cup of apple cider concentrate? Or do we actually reduce 1 1/2 cups apple cider concentrate down to 1/2 cups of super-reduced concentrate? Thanks for your site…I enjoy seeing your work! that’s exactly what I mean! i was trying to keep it short, but I’ve updated this to make it more clear 🙂 and thank you!! Oh man that looks amazing!! I love the idea of decorating a cake using donuts – I’m definitely going to have to remember that for the future!! When is the apple cider concentrate added to the cake batter? I’ve read through the instructions twice and I don’t see the direction to add the concentrate, unless I’ve somehow missed it. Is the depth of your cake pan 2” or 3”? How do you get the layers to be that thick? my pans are 2 inches tall! for the cake in the photos, I used 8 inch cake layers, which actually were less thick than my normal cake layers! !